In which Spider-Man learns the hard way that great power should be used for more than just wrestling matches. Mega Powers come with mega responsibilities. Peter Parker, aka Spider-Man, straight off his wrestling “win” and wearing his homemade costume. Played by Tobey Maguire. A carjacker, no name given here but in the third film it’s revealed that it’s Dennis Carradine (he’s not named in the comics at all). He’s desperate enough you can practically see the flop sweat, but is definitely no “misunderstood” sweetie with a good heart; just a petty thug, through and through. Played by Michael Papajohn, a veteran stuntman who has probably had to hear a lot of stupid pizza jokes. Armed with: Pistol and knife. The Setup: After Peter leaves the fight promoter’s office, a thug storms in and robs him at gunpoint. He soon storms out with security in pursuit, and Peter, having just been cheated out of his winnings by the promoter on a technicality, deliberately lets the robber escape rather than stopping him. After Peter exits the building to meet up with his ride home, he finds emergency personnel swarming over a recent crime scene– his saintly Uncle Ben has been shot by a carjacker, while waiting for Peter. Ben (who Peter had last exchanged harsh words with), expires quickly, but Peter hears police talking about their pursuit of the suspect, and is spurred into action. 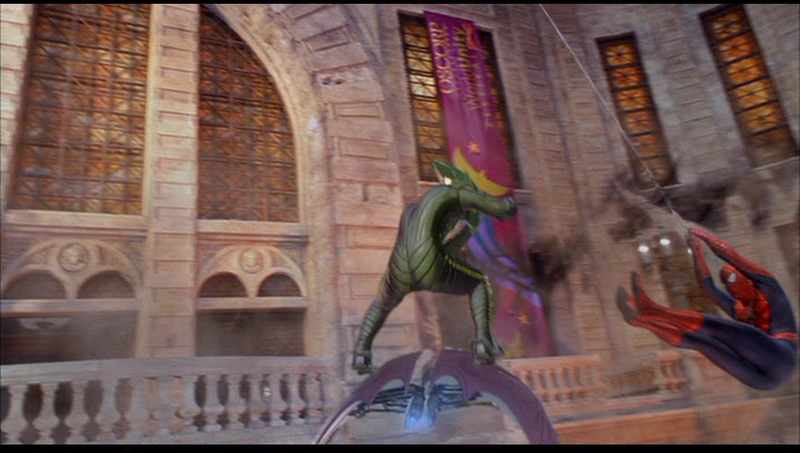 The Fight: Peter flees the scene and strips down to his rasslin’ costume, crawling up to a high building. Spotting his uncle’s stolen car (actually Sam Raimi’s own 1973 Oldsmobile, which has a cameo in almost all his movies), Peter hooks a web line, and even in his rage he pauses, knowing he’s about to try something crazy. His previous attempt at genuine web-swinging had merely sent him careening face-first into a wall, so a sustained chase is like going straight from crawling to cartwheeling. Spastic or no, Peter does manage to catch up to the car, landing on the roof. The carjacker (smartly filmed from this point on either moving frantically and/or in the dark, with a cap or ski mask obscuring the top of his head) fires a few rounds upwards. Peter isn’t hit but he does get shaken off. Further pursuit allows him to land with a backflip on the car’s hood, where he takes the liberty of punching the windshield and crashing the car. While pursuer and prey are briefly separated, the carjacker flees on foot into a nearby abandoned building– a factory, by the looks of it– and takes refuge on a higher floor (dumb move, because if the police show up he has nowhere to run). Though the police are in hot pursuit, Peter does take a few mintues to stalk and menace his panicked target, almost giving off a Batman-esque vibe. But he soon reveals himself, and immediately grabs the crook from behind, slamming his face through a couple of glass windows. He knocks the gun out of Carradine’s hands, and when the thief switches to his knife, Peter dodges a swing from that, and disarms him once again with this nifty backflip move: as he spins over backwards, Peter’s feet kick the handle of the knife, and the momentum of his flip sends the weapon flying straight into the wall behind him. Wildly unnecessary but really cool. Peter then kicks Carradine against the wall, and in the shot between when the kick is delivered and when the actor stops moving, Papajohn has somehow regained his gun and lost his cap. It’s a really bad editing mistake, but then I’ve seen this movie at least six times and I didn’t notice it until I was going through parts of this scene frame by frame to look for screen grabs, so how bad is it really? He begs for mercy and Peter refuses to give it. But when Carradine’s face is illuminated by a police spotlight, he’s revealed– what a tweest!– to be the same crook that Peter smugly let pass. Again pulling from the Simple & Effective playbook, Raimi and co. made the smart decision to give the criminal a distinctive (though not completely bizarre) hair style: pronounced widow’s peak, with a thick mop of peroxide blonde on top and dark, short hair down low. Thus, the audience immediately recognizes him (ironically, this is the opposite of smart thieves, who try to cover up or just not have any distinguishing features that would make them easy to remember. But of course, most thieves aren’t smart). Unfortunately, Raimi negates that immediately by replaying the elevator encounter in slow-motion (it’s not a flashback of the exact same footage, but Peter’s subjective memory of it), but even that was probably necessary– don’t ever underestimate how slow and inattentive some audience members can be. 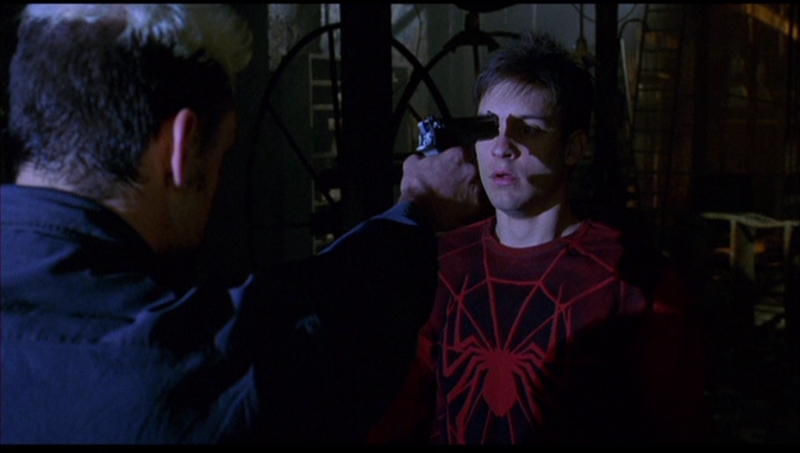 Anyway, Carradine takes advantage of Peter’s stunned shock to level his magical teleporting handgun at the boy’s face. In the comics, Peter’s spider sense can be circumvented by the Venom symbiote and also some specially made Green Goblin chemicals. In the movies it’s only canceled out by overwhelming personal guilt and/or plot contrivance. But Peter’s still fast enough to knock the gun away, again, and Peter twists Carradine’s wrist pretty bad, seemingly breaking it. The crook stumbles backward a bit in pain, trips over an exposed pipe, and falls out through the window, dead on impact. Peter flees the scene. When it comes to the actual fighting, this is another skimpy and one-sided battle; no real challenge, just quick and intense. Maguire plays a great range of fear and fury, and Papajohn is appropriately skeevy as an all-too-realistic type of dangerous low life. It might have been gratifying to see Peter wail on the thug some more, but actually his brief acts of brutality hit the sweet spot: providing a touch of non-exploitative excitement and still clearly out of character for Peter to be deliberately jarring. The only thing the scene really does wrong is the aforementioned editing error, and again, how bad is that really in the grand scheme of things? Random Pondering: The circumstances of Uncle Ben’s death (arguably improved here from the more convoluted and coincidence-reliant version in the source material) are well-known to just about all comics fans, but from what I’ve seen, before this movie they didn’t enjoy the same level of cultural penetration as did, say, the death of Bruce Wayne’s parents. And even without knowing that, the back-to-back occurrences of Peter letting an armed criminal escape and then his uncle getting shot off-screen seem way too easy to connect for that final reveal of Carradine’s face to be a genuine surprise. So I ask: were YOU, or someone you know, genuinely shocked when you first saw this movie and found out the carjacker was also the thief? Don’t be afraid to admit it, this is a safe place. Much like fighting in the war room, there’s no judging at Grading Fight Scenes.